Decision: Should you play Awakened Weapon? 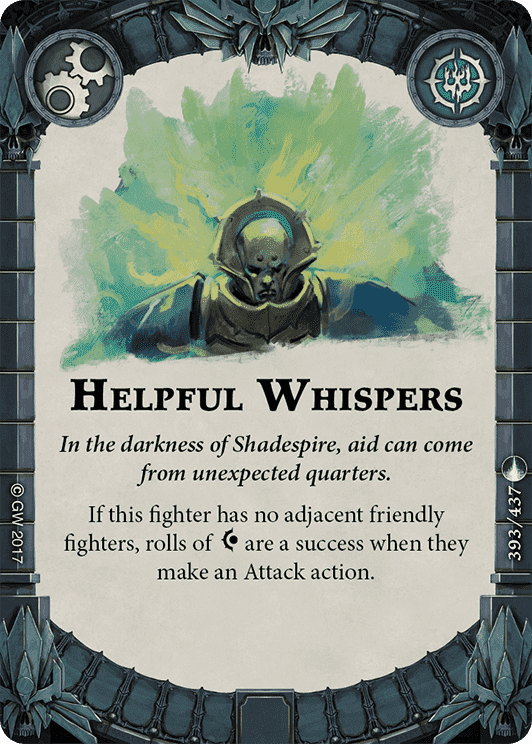 Helpful Whispers grants a larger bonus to most attacks if you can meet its requirements. Exceptions include attacks that gain a benefit from rolling criticals and those that roll 1 die to start. You should probably be playing both. For the purposes of this article, we'll be using a basic reroll strategy that optimizes accuracy. For any number of dice X, we will elect to use Awakened Weapon on any roll in which the number of successes is less than X. Essentially, unless all of your dice come up successes, we'll reroll one of the failures. Later on, we'll discuss some advanced rerolling options. In the case of Awakened Weapon, all of our rerolls will be "blind" - meaning we won't know our opopnent's defense roll before we must decide whether or not to use the reroll it provides. The ability to reroll a single attack die represents an improvement to raw accuracy - the chance that you will roll at least 1 success - that is effectively equal to adding another attack die of the appropriate type. For example, Gurzag's Boss Choppas is a 1/2/3 axe attack. 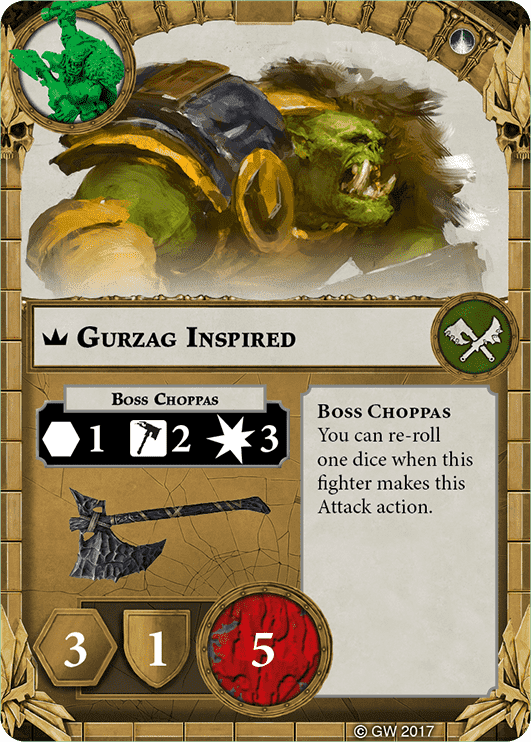 When Gurzag is inspired, he can reroll a single attack die on any attack he makes with Boss Choppas. Effectively, for determining raw hit chance, this makes Boss Choppas a 1/3/3 axe attack, which represents an increase in average damage by 0.375 for each unblocked use. It's worth noting that adding additional dice to an attack represents a lower marginal gain in raw accuracy on rolls that start with a higher number of dice; the same can be said of rerolling. Rerolling a single die on a 1 die attack means it will succeed twice as often, while rerolling a single die on a 2 die attack will only succeed 50% more often. Rerolling a single die also raises the rate at which you will roll multiple successes on a 2+ die roll. The increase happens in a predictable pattern, resulting in your chance of rolling any given number of successes equal to the chance of getting the same number of results on a roll with one more die. For example, a 3 die attack with a single rerolled die has the same chance of rolling 2 or more successes as a 4 die attack. In this scenario the same can be said for the chances of rolling 1 or 3 successes. The obvious difference is that a 3 die attack simply can't roll 4 successes at all. 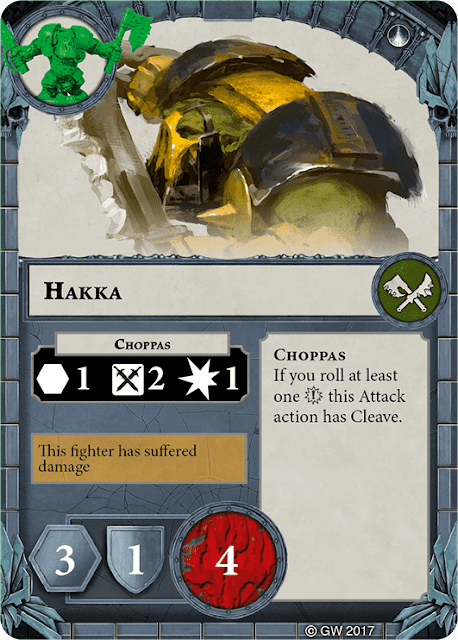 Shadespire's dice system throws in a vexing (if necessary) complication in the form of criticals. In general, the chance of rolling a critical on a single die will be less than the chance to fail the roll. Therefore, it's rarely optimal to reroll a successful result in order to "fish" for a critical. However, there are some cases where you should reroll a success. The first situation is when you have an overwhelming advantage in the number of dice you rolled. For example, let's say you rolled 3 non-critical successes on a 3 die attack. Your opponent. only has one defense die. Knowing this, you should reroll one of your successful attack dice in an attempt to get a critical. In this scenario, you retain the same chance to successfully overcome your opponent's defense (they need a critical roll to avoid your attack whether you have 2 or 3 successes), but gain a ~17% chance to make your block effectively unblockable. Not all models are created equal (sorry, Sepulchral Guard). As such, Awakened Weapon works better on some targets than others. As mentioned above, models that roll fewer attack dice benefit more from Awakened Weapon than those that roll more dice. Additionally, there are several models that gain additional abilities when they roll a critical success on attacks. These models gain extra benefit from Awakened Weapon. For example, Sanson Farstrider's Star Falcon attack does an additional point of damage when you roll at least one critical. At base, when criticals are considered, Sanson rolls a critical on 42% of this attack. Once you upgrade Farstrider with Awakened Weapon, his chance to roll a critical with Star Falcon rises to 52%. When we factor in the increased damage ability of Star Falcon, this results in an increase in average damage per unblocked use of 0.1952. 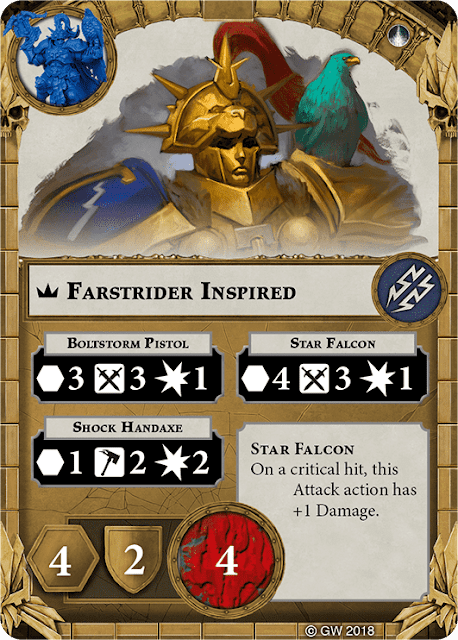 We can compare this with one of the other Farstriders' Boltstorm Pistol attack, which only gains an increase of 0.0988 damage per unblocked use in the same situation. Essentially, Sanson gains twice the benefit from Awakened Weapon because of his special ability. Helpful Whispers provides an excellent point of comparison for Awakened Weapon. As we've seen in previous articles, rolling an additional die generally gives you less raw benefit than upgrading your success chance on the dice you already roll (with the largest exception being on rolls that start with only 1 die). As seen above, Awakened Weapon's reroll is generally comparable to rolling an extra die, but not quite as good in a few key ways. Thus, in most cases, Helpful Whispers will grant you a larger increase to both raw accuracy and the number of successes rolled than Awakened Weapon. However, Whispers has a restriction - that your model may not be next to any of your other models in order to gain the benefit - that Awakened Weapon does not suffer from. Additionally, Whispers does not increase your chance to roll criticals. Finally, a model using Awakened Weapon still benefits from single model support, while one with Whispers gains no additional benefit. This last caveat is especially important when considering which card to play in a given warband - those with more models benefit less from Whispers, as do those that depend on keeping your models together like Gitz (thanks to John McDonnel from The Warhammer Underworlds Community Facebook page for pointing out the Gitz would rather shout than whisper). If Whispers grants you a greater increase to accuracy, why do we see Awakened Weapon in so many more decklists? Certainly, Weapon has some benefits that Whispers doesn't, and isn't restricted by positioning. However, it is likely that the prevalence of Awakened Weapon over Whispers is in part psychological. Rerolling dice makes us feel like we have greater control over the game than passively increasing success chance. Awakened Weapon's reroll ability mimics rolling an extra die on attacks very closely. This effect is most apparent attacks that roll low numbers of attack dice to begin with. Additional benefits can be gained by upgrading models who activate special abilities based on rolling critical successes. Overall, Helpful Whispers represents a greater increase in accuracy than Awakened Weapon, but does place some restrictions on positioning. 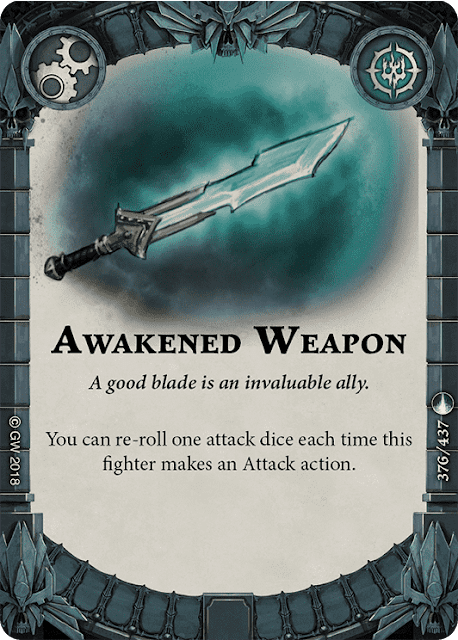 In general, if your attacks roll lower numbers of dice (particularly 1 die) or your attacks have added benefits based on rolling critical successes, you should play Awakened Weapon. Otherwise, Helpful Whispers is likely the better option.